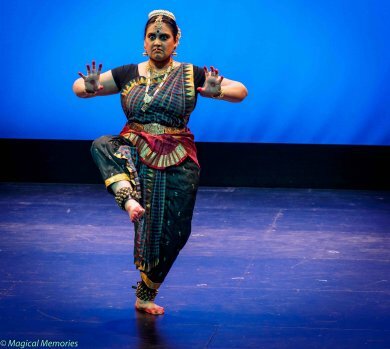 On February 6, 2016, California Bay Area rasikas were treated to a rare presentation of the Mysore style of Bharatanatyam by San Ramon based Naina Shastri, the Artistic Director of Ushanjali Dance Academy. The orchestra started out vibrant, with an energetic jathi in Khanda Nadai, the beginnings of a Melaprapti. It was a tandava element juxtaposed with lasya style of dancing that followed, which drew attention to the high quality of the musical/vocal/nattuvangam renditions, in spite of a hesitant start. Naina has an unhurried approach and her natural stage presence keeps her presentation strong. This is perhaps one of the significant contributions of the Mysore style; it places an emphasis on the dancer’s gravitas, since she cannot rely on pure technical exertion. Melaprapti was followed by a Devi stotra “Jatajoota samayuktam.” Naina adapted the original choreography by Dr. Vasundhara Doreswamy to the Mysore style. This led the way to a Churnike (choreographed by Dr. Radhika Nandakumar), a prayer to the Rangadi Devate, the protector and the deity of the sacred stage. Together, these 3 pieces constitute a simplified version of the Poorvaranga Vidhi (pre-stage ritual) followed in the Mysore tradition. Naina took charge of the stage here, though a change of pace with some gati interludes would be welcome. The theme of the evening was ‘Samara, A Woman’s Fight.’ The first manifestation of this was in ‘Yudh’ based on the Queen of Jhansi. Naina had choreographed this based on select verses from Subhadra Kumari Chauhan’s, “Khoob ladi mardani woh to Jhansi wali rani thi,” which was aptly set to music in raga Mahati (greatness) by Snigdha Venkataramani, also the singer at the show. Naina portrayed Laxmi Bai training as a warrior, then wife of the king, widow, and then queen. With Subhadra and Snigdha providing the context and drama, Naina was able to paint the picture of rebellion successfully. General Dalhousie’s role was revealing and Naina was able to switch characters seamlessly. When Laxmi Bai realizes that she has no choice but to lead, the emotion required at that moment was a mix of veera, shaurya, and a touch of the human. Naina delivered on this, which was a highlight. At times though, the wordiness of the poem overwhelmed the dancing. Laxmi Bai’s valor contrasted with what came next, a queen who could not lead, who sank into a passive introverted fight, in the form of Kausalya. Through “Kausalyeya vedane” (Kauslaya’s lament), Naina showed her helplessness at fate’s cruel game in sending Rama away for 14 years. “Don’t, don’t, oh please don’t say that again” cries an anguished Kausalya, that took us right into the epic. Of particular interest was when Kausalya gets the news of Dasharatha’s passing. It made one think about how little emotion she had left in her, only enough to say, “Bring Rama back!”Naina’s sense of self came into play here as well: she could very easily have overdone the lament, but she kept her character in a balance of agonizing and sad acceptance. Lyrics and music for Kausalya’s lament “Arasinalidihalu” was specially composed by K.V. Ramprasad, in Ragamalika and misrachapu tala. If “Kausalyeya vedane” was the height of human endurance, the next piece, “Nee maatale mayanura” was the depth of human pettiness and made for an entertaining segue. Naina’s descent from indulgent, suppressed excitement to petulance was swift and well portrayed. A highlight was when she’s decking up in anticipation of her husband’s arrival. She marvels how her jewelry looks good on her, starts to wear it, then reconsiders. After all, her husband would be getting her some! Only, he doesn’t. So every time she moves her hand she misses seeing the promised bangles, resulting in a fresh barrage of cribbing. Naina managed to not let the nayika slip into utter samaanya-ness, rather, her nayika stayed consistent as the Entitled-One-That-Was-Wronged. Kudos. From pettiness, we were transitioned into the satvika, through Meerabai’s bhajan “Gunjan banjani.” Meera’s was a fight with a world where other people lived, hers was a world filled with bhakti. A highlight here was when Naina shared the line, “How I wish I was a fish, so I could touch his feet as he splashed in the river.” The look of divine bliss as the fish looked up at Krishna was special. Meera sought happiness in another world. What’s Indian at the Grammys?